Our Leather and Faux Leather Dining chairs all designed with Style, comfort, and Durability in mind. Our Leather and Faux Leather dining chairs ranges are among the most popular in the U.K. due to their high build quality, eye catching styles, and classic & contemporary colours. The chairs are manufactured to very high standards from the best materials available. The Stylish materials are thick, durable and available with some classic colours and attractive grain. We also offer a free sample service for the colours in case you need to make sure the colour is right for your decor before you buy. Just drop us a request to sales@capitaldiningchairs.co.uk and we will get them in the post fro you 1st class. As with all of our quality dining chairs delivery is free of charge Nationwide. If you need anymore information on our dining chairs please call Free on 0800 599 9795 and one of our friendly staff will be happy to guide you to you new furniture. 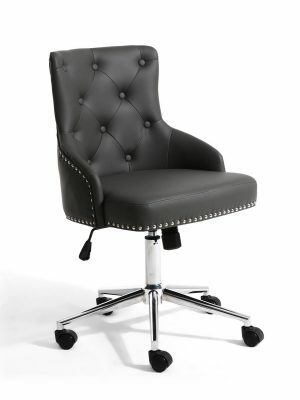 The Brent Grey Faux Leather Office chair is a fully adjustable office chair styled in a traditional Chesterfield inspired button back design, and upholstered in an eye catching on trend dark Grey faux leather material. 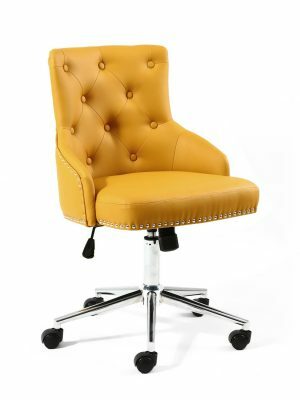 The Seat itself is padded with high density foam for a very comfortable sit, and the quality upholstery is hand laid and buttoned, and finished with attractive chrome stud work around the edges. For Full Description and Sizes please see below.